Medtronic is the world’s largest standalone medical technology company with a revenue of over $20 billion in 2015. Medtronic Neuromodulation, one of the company’s largest departments, has implemented codeBeamer ALM in 2015 to overcome issues that their previous software ecosystem wasn’t able to efficiently address. Download our case study to learn how exactly they have implemented Agile processes using a cutting-edge ALM platform. With their previous toolset, this Medtronic department found it challenging to manage traceability, process management and transparency, collaboration, QA & test management, documentation & reporting, and DevOps. This case study explores how codeBeamer ALM has helped Medtronic address these issues conveniently and efficiently. 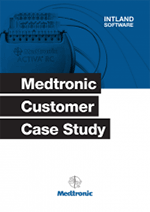 Download the case study to find out how Medtronic was able to scale Agile in their organization while maintaining compliance with a number of medical regulations and standards. The case study describes in detail the evaluation and decision-making process, and how codeBeamer ALM was able to effectively assist the world’s largest medical technology company in making the transition from legacy systems to cutting edge solutions and Agile processes.